Over the past year, I had been selling my old fashion TRIAC / incandescent color organ. Though an improved “phase modulated” circuit, over 70’s vintage SCR color organs, it still operated at full AC line voltage. To keep it safe, I only allowed the audio to come into that circuit by way of a microphone. In the last 20-years, LED technology has improve such that it is now just starting to replace older technologies in illumination. 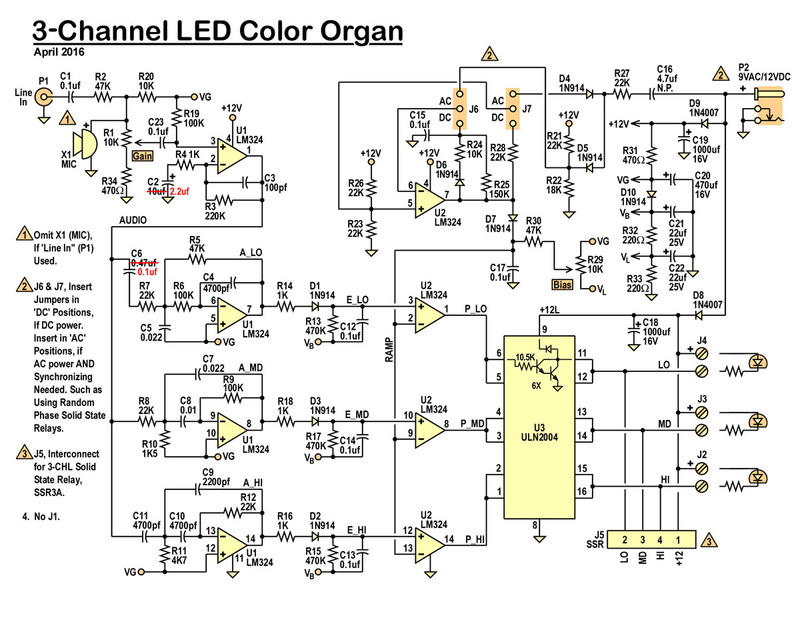 A few LED color organ kits are on the market, and I’m throwing my own design into the mix. It has a few features that will differentiate it from other designs: Audio can either come in thru a microphone, or a direct electrical connection. The LED intensity is pulse width modulated, which in itself is not unique, but can also be synchronized to the AC line, so that this circuit can drive “random phase” solid state relays, to drive 120V (or 240V) incandescent lamps. I will also sell a 3-chl solid state relay kit, separately, that will plug right into this board. Since, this kit drives LEDs, and intended to drive 12V LED strips, it runs off of low voltage. Either “12VDC” (10V to 15V), or 9VAC. This makes this kit quite safe. Maybe even kid-safe, with exception of letting a little tyke handle a hot soldering iron and lead solder. 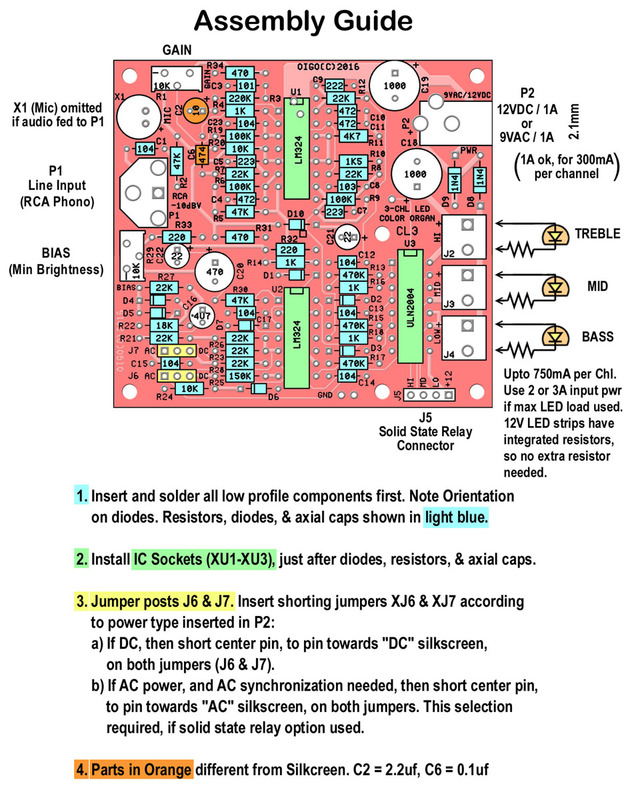 Audio can enter the circuit in two ways. Either thru the microphone, X1, or thru connector P1. P1 is an RCA phono jack, which is the common audio connector found on the back of most stationary home electronics. The interconnecting cables can be found in many stores, including Walmart, and Target. I would usually list RadioShack, but that horse is pretty much dead. The two different audio sources, can have their levels adjust by R1. The audio is amplified by one stage of U1, before being fed to three separate filter circuits. Each uses a stage of U1, and allows only certain frequency range to pass thru. They are 2nd order filters, that are more selective (limiting) than the 1st order filters used on my other 3 chl color organ circuit. The three audio (A_LO, A_MD, and A_HI), are then fed to their respective envelope demodulator, so that the signal that sets the light intensity, is envelope (transient maximum level) of the audio. To make sure that the 0.7V diode drops, of D1 thru D3, don’t mask the lowest audio levels, the signal is pre-biased, so those diodes are already conducting, past that 0.7V level. The audio signals, A_LO thru A_HI, idle at VG (~6V), while the envelopes, E_LO thru E_HI, idle at VB, which is 0.7V lower. U2 converts these audio envelopes (E_LO, E_MD, and E_HI) to modulated pulse trains. One stage of U2 can either be set to act as a free-running pulse generator, at roughly 110Hz, for DC power operation, or issue pulses at the AC zero crossings, when AC power is available, and used. There are jumpers J6 and J7 to select which mode is to be used. AC power is needed if the solid state relays are to be used. In either case, the resultant pulse train (free-running 110Hz “DC”, or sync’d 100Hz/120Hz “AC”) will pulse and reset a sawtooth ramp. This ramp, starts high, and slowly ramps to a lower voltage, until reset, high again, by the next pulse. The Ramp is fed to the inverting input of the other 3 U2 stages. At some point, the Ramp voltage drops below the level of the envelope signals, fed to their respective U2 non-inverting input. When that happens the output of that stage will swing to the positive power rail. The higher the envelope level, the earlier in the ramp cycle, that will occur. The result is wide pulses for high signal levels, and narrow to low signal levels. When used with AC, and AC selected, this pulse is perfect for triggering the TRIACs of random phase solid state relays. With either selection, it will nicely vary the brightness of LEDs. LEDs and/or solid state relays are driven from high current darlington drivers in U3 (ULN2004). Each channel can safely drive upto 750mA of current. This is the equivalent of 10 15-LED 12V strips (or 150 LEDs per channel). 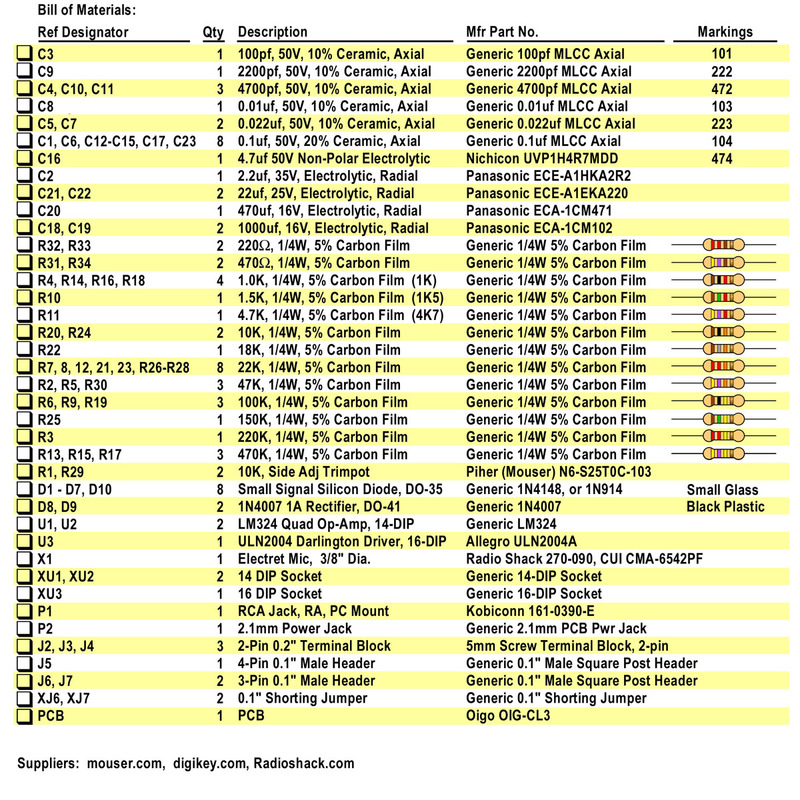 All of the parts listed above, come with the kit. The kit needs to be supplied from a low voltage source. Nominally 12VDC, if only LEDs are to be used. It can even be your car battery. The circuit can operate with voltages as high as 20V, with no harm. Any plug-in wall-cube can also be used, and is the anticipated source, thru the 2.1mm power jack, P2. Note: Center-Positive. The assembly drawing shows 1 amp, but the current capacity, is dependent on how many LEDs are connected to terminals J2-J4. Each channel can drive 750mA max, for a total of 2.25A. If you intend to max out the LEDs, then a 3 Amp wall-cube is recommended. D8, is a 1N4007 which can only handle 1A. If a wallcube greater than 1 Amp is used, then its should be DC, and then D8 can be bypassed, by replacing it with a simple wire. Jumpers J6 & J7 are to be shorted in the “DC” position. Shorting Jumpers XJ6 & XJ7 are provided for this task. If a solid state relay is to be used, then AC must be selected (J6 & J7), and a nominal 9VAC wall-cube used. The current rating is 1A, and if any LEDs are attached, in addition to the relays, the current out of terminals J2-J4, must be limited to 300mA each (or 4 15-LED 12V strips; 60 LEDs per channel). Note: the polarity on terminal blocks J2 thru J4. The terminals marked (+) are the, respective, positive terminals. If pre-assembled 12V LED strips are used, the red wire goes here. If you are using descrete LEDs, then the anode is tied to the positive. Also, using descrete LEDs, require a current limiting resistor. Pre-assembled 12V LED strips have those resistors integrated in the assembly, and pre-calculated to run properly at 12V. Actually, their makers knowing that these often end up in cars, design them to survive 15V, for extended periods. Wall cube power supply suggestions: Jameco 9VAC 1A (#102234), Jameco 12VDC 1A (#252824), or Jameco 12VDC 2.5A (#2215726). A US source for 30cm (~1ft), 15LED, 12V colored LED strips: xFriction. I have no affiliation with this eBay seller. The only criteria, is that the seller is US based, and a fairly decent feedback score. This unit can be adapted to power large incandescent lamps, using TRIACs, as a traditional color organ. A few customers, like the traditional color organ, but want it to be safely connected to their sound source (amplifier), without using the microphone. A special “daughter board“, has been designed to be added to this unit. Its an electrically isolated 3-channel Solid State Relay. It has been specifically designed to plug into this color organ. Unlike many other solid state relays, this one is random phase. That means the TRIACs can be turned ON at anytime during an AC wave cycle. Most solid state relays, can only be turned ON at the zero-crossing. All TRIAC based solid state relays, including this one, turn OFF, at the zero crossing. The random turn ON is needed to vary brightness. 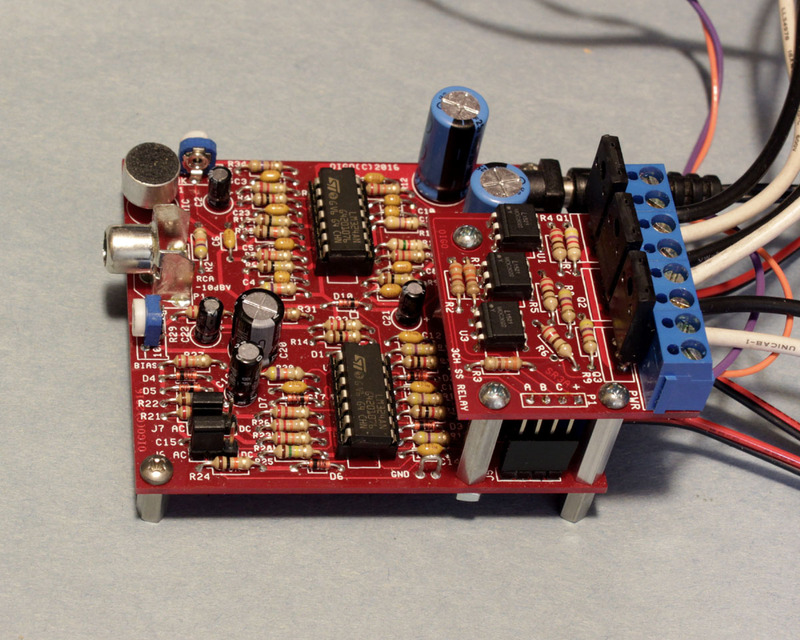 This 3-channel solid state relay, though designed for this unit, can be used as a general purpose solid state relay, and controlled with 5V logic, in projects unrelated to this color organ kit.